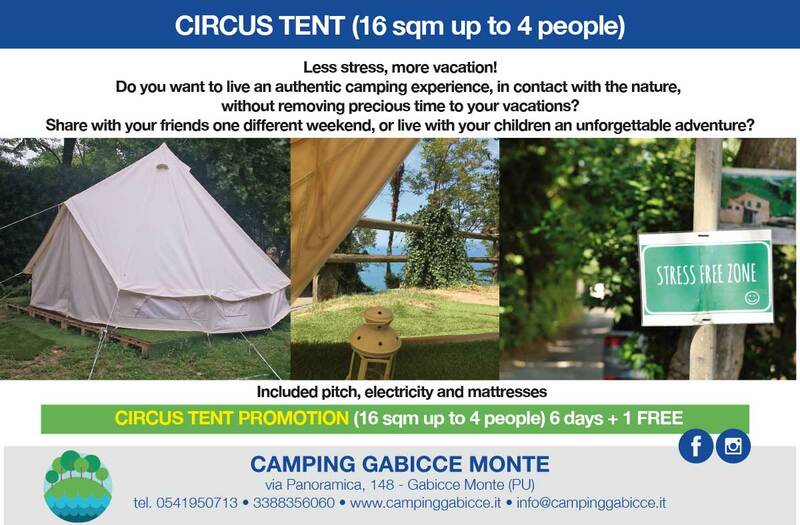 Rent a ready and equipped tent and focus only on the relax. Tents for 4 people, ready to welcome you, equipped with mattress, table and chairs. Cancellation after 7 days before the date of arrival, the entire deposit will be charged. In case of arrival after the booking date or interrupted stay, the client must PAY the entire booking period. The maximum delay allowed, apart from the last-minute exception communicated via phone, is at 21:00 of the day of arrival, after that the management can re-allocate the pitch/tent without notice. CHECK-IN and CHECK-OUT: tents will be returned before 16:30; they must be free before 11:00 of the leaving day. In the low and medium season it’s possible, with the permission of the management, to checking out later, before 15:30, paying a percentage of the day cost based on the season. DEPOSIT UPON ARRIVAL a deposit of € 20,00 is requested and will be returned before departure, after checking any loss or damages.